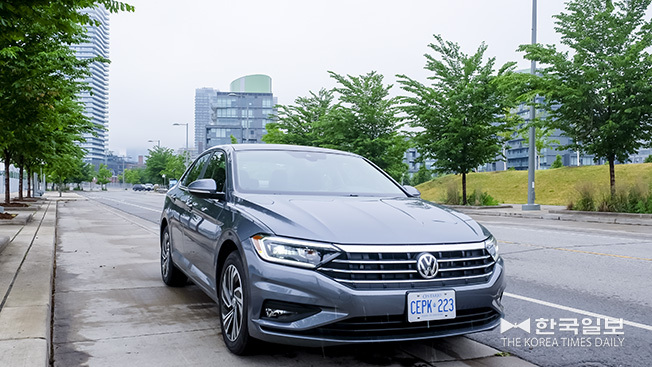 When it comes to the exterior styling of its vehicles, Volkswagen is not big in adopting revolutionary changes to differentiate one generation from the next. When the German manufacturer finds something that works, it stays with it and takes only incremental steps to make improvements. So take a gander at the all new 2019 seventh-generation Jetta. There’s no mistaking it for any other model; there’s also no mistaking that the new car is clearly different from the one it replaces. For one thing, the Jetta now shares the ‘global’ MQB architecture with other VW stable-mates as the Golf, Tiguan and the Atlas (along with some Audi models). Underpinned by this modular platform, the new sedan is slightly bigger in every dimension compared to the sixth-gen Jetta. At first glance, the new outer skin looks much like the old one, but with little more slope to the roofline. Moreover, the hexagonal front grill seems to be bigger, accentuated by triangular shapes at the outer edges of the front bumper. From the back, the dual chrome exhaust tips incorporated into the bumper look slick. Unfortunately, they are fakes. Overall, the seventh iteration is sleeker and gives off a little more attitude. From some angles, it even takes on the profile of an Audi… not a bad thing. As a player in the still-competitive compact sedan market, the Jetta seems to be doing relatively well. Even as a pricier choice than the volume-sellers – Civic, Corolla, Elantra – the Jetta’s customer base appears to remain pretty loyal. Perhaps that’s why the base Trendline is available no more. The least expensive model is now the Comfortline, starting from $20,995 before taxes and other mandatory fees. The VW enthusiasts, if grudgingly, would be okay with this. The Highline and Execline follow in the lineup. For now the only power-plant available is the 1.4 litre turbo four. The tiny motor still manages to generate maximum 147 horsepower and not too shabby 184 lb-ft of torque. The motor sounds little coarse at times, but has plenty of power for most everyday situations. 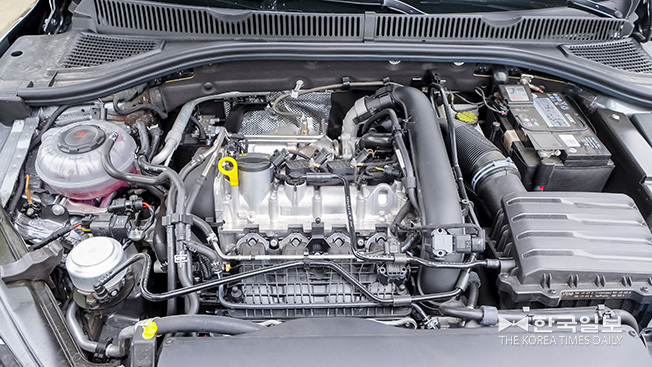 More than that, mated to the eight-speed automatic transmission, the engine manages to achieve impressive 7.8 litres of regular gas per 100 km in city and 5.9 litres on highway. (The official fuel number is virtually same for the manual.) The Jetta is one of the most fuel-efficient cars in its class. The Execline test-vehicle provided to this writer enjoys plethora of standard equipments, including ‘Tornado’ 17’ alloys, 8-speaker Beats audio, power sunroof, navigation, heated leather seats, power driver-seat adjustment, keyless entry and pushbutton start, etc. This car’s $29,095 sticker slides up to $30,090 when the $995 Driver-Assist Package is added. 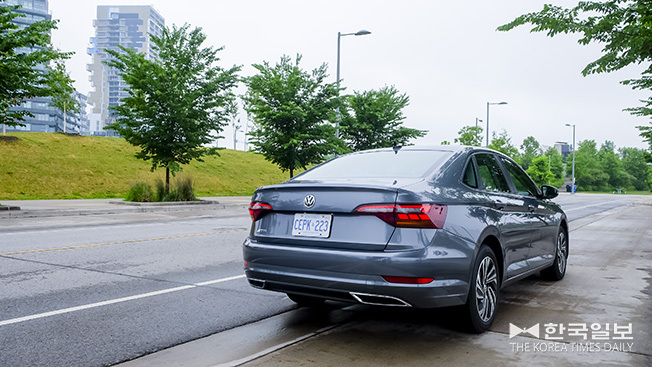 VW has well-deserved reputation for the comfortable and supportive driver’s seat and the new Jetta is no different. The familiar VW interior is tad sombre but the instrument panel is cleanly designed and every buttons and dials fall into place nicely. The leather-wrapped steering wheel feels somewhat light and less connected, though. Four drive modes are provided: Eco, Normal, Sport and Custom. The Eco and Normal do not feel all that different. However, in Eco, the car starts from second gear. With the Sport mode, the car takes on a little more urgency. However, the transmission still up-shifts pretty quick in order to save gas. Personally, it is a good thing that the auto stop/start can be simply switched off with push of the button. The previous generation Jetta is no slouch when it comes to handling. The new car suffers a little in this regard, having gone from multi-link rear suspension to torsion beans to save money. Although, it is after all a family car and not a dedicated sports sedan. To prove that point, the suspension now seems to be softer than before for better ride. As opposed to the Eurocentric Golf, the Jetta puts more focus on appeasing North American tastes. Those wishing for sportier version can wait for the arrival of the Jetta GLI, slated for late this year or early next year.